If the answer is yes, you are definitely not alone. This common complaint may affect up to 30% of the population, with an even higher incidence among university students and females. Despite how common this condition occurs in our population, there has not been a substantial amount of investigation into practical and non-invasive ways to manage acute or recurrent jaw pain. Luckily, recent research studies have identified some comfortable and effective strategies that can be easily implemented by manual health practitioners, such as chiropractors. The temporomandibular joints (TMJ) are the joints that connect your jawbone to your skull. Typically we do not give much thought to our TMJ as we go about our day, however these joints are highly active whenever we talk, chew and swallow. It is usually not until we experience pain in this joint complex that we understand how frequently we rely on proper function of the TMJ. There are muscles surrounding the TMJ both intraorally and extraorally that contribute to the movement of the jaw. Like any other muscles in the body, they too are vulnerable to repetitive stress and can become painful under certain circumstances. 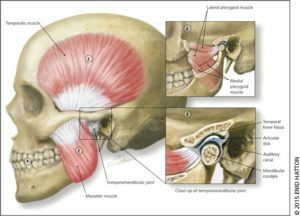 Temporomandibular disorders (TMD) are a class of disorders affecting the muscles surrounding the TMJ and/or the joint complex itself. The most common type of TMD is muscular (up to 50%) and typically present as discomfort or pain in the muscles controlling jaw movements as well as the neck and shoulder muscles. Symptoms can present as muscle and joint tenderness, popping or clicking, decreased jaw movement, altered mechanics or occasionally ear symptoms (ringing, sensation of fullness). Commonly affected musculature related to the TMJ includes both muscles outside the mouth and inside the mouth. All effective care begins with an appropriate examination. As with any patient examination, the chiropractor will take a history and perform a physical exam to identify the affected structures. This includes not only structures of the TMJ but also related dysfunctions in the neck and shoulder. 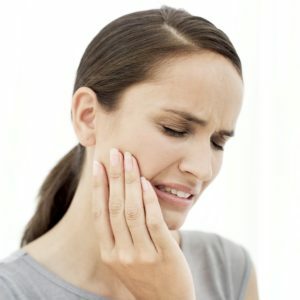 In fact, evidence has demonstrated that those who suffer from TMD frequently have impairments in the upper region of their neck that are often not identified. A thorough examination will identify these related issues and address them when constructing an effective plan of management. Gentle joint mobilization of the TMJ has to shown to be effective at relieving joint pain by stretching tight muscles and ligaments surrounding the joint. Vibration has been shown to be an effective tool to help manage joint and muscle pain. By utilizing a handheld device, a practitioner can transmit the vibration through their own fingers and target specific muscles both outside and inside the mouth (with gloves on of course). TMD disorders are quiet common. Chiropractic care is a safe and effective way to manage your jaw pain. Call and book your chiropractic appointment today! Muir B, Brown C, Brown T, Tatlow D, Buhay J. Immediate changes in temporomandibular joint opening and pain following vibration therapy: a feasibility pilot study. The Journal of the Canadian Chiropractic Association. 2014 Dec;58(4):467. Grondin F, Hall T, Laurentjoye M, Ella B. Upper cervical range of motion is impaired in patients with temporomandibular disorders. Cranio®. 2015 Apr 1;33(2):91-9. Haketa T, Kino K, Sugisaki M, Takaoka M, Ohta T. Randomized clinical trial of treatment for TMJ disc displacement. Journal of dental research. 2010 Nov;89(11):1259-63.